I created this 4 page double truck magazine layout for my Design for Journalists course. 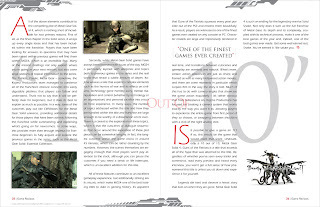 This is my first ever magazine layout, paying homage to my favorite videogame of all-time, Metal Gear Solid 4: Guns of the Patriots. 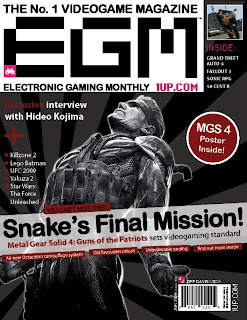 The idea for my layout was to connect it with the EGM magazine cover I created a few months ago. Crucial to good design, white space is often overlooked. I wanted to have white space in my layout, because of its simplicity. it's clean and strong all the while engages the reader at the same time. For my color choices, I basically took the red black, gray and white from the MGS4: Guns of the Patriots logo. These colors complement each other quite nicely, and have strong associations with simplicity and strength. It was the perfect color choice to convey the tone and feel I was going for. For my typographic choices, I used Trajan Pro for my headline because it is a very clean and elegant typeface. It is also very distinctive, so I thought it was perfect for the headline. For body copy I used ITC Medium Eras. Eras is a beautiful sans serif typeface that is unique because of its 2 degree slant. Not quite italic, but still distinctive nonetheless. 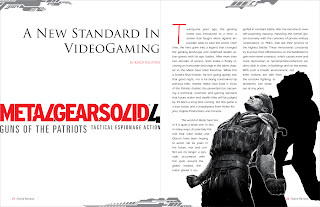 I opted for a sans serif for body copy over a serif font because I wanted to give my article a modern appeal for a younger (gaming) audience. A classic serif font such as Stempel Garamond or Times New Roman would have worked, but I also wanted to contrast the body copy with the Trajan Pro I used for the title. Lastly, I used Avenir LT Std for my page numbers at the bottom. I chose a different typeface from the body copy for additional contrast. Also, Avenir is very readable at small font sizes.